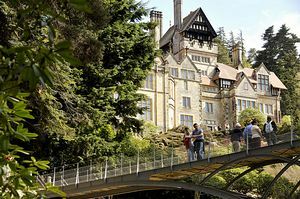 A visit to Cragside lets you enter the world of Lord Armstrong - a Victorian inventor, innovator and lanscape genius. Cragside house was the wonder of its age, and was the first house in the world to be lit by hydro-electricity. Lord Armstrong's amazing creation, the garden at Cragside offers breathtaking drama whatever the season. Walk through one of Europe's largest rock gardens, and you can cross the Iron Bridge. On the other side, you'll find a fabulous Victorian formal garden. Across the valley, hidden amongst the trees is the clock tower. This clock not only struck the hours, but also used to chime the starting, finishing, and meal times of the estate workers. It can still be heard across the estate. Seven million trees and bushes were planted to cover the bare hillside and create the wooded estate you can explore today. Over 40 miles of footpaths and lakeside walks lead you through the woods to the estate's secret hide-aways. How many can you find? Children, will love trying to find their way around Nelly's Labyrinth and playing on the slides, swing and tunnels in the Adventure Play Area. Nature lovers are well catered for, with a Pinetum, Autumn Colour Walk, and a wildlife hide. If you're lucky you might even spot a red squirrel. Spot our wooden sculptures; how many will you find? Visitors with disabilities are welcome at Cragside - to help you plan your visit please call us to discuss your requirements. Dogs are welcome on the estate. Guide dogs only are allowed in the house, formal garden and visitor centre buildings. Dogs are not allowed in the adventure play area. With so much to see, you will need a whole day to explore all that Cragside has to offer. We hope you will enjoy your visit and will return again soon. Entrance 1 mile North of Rothbury on the B6341 (Rothbury-Alnwick Road). 15 miles north west of Morpeth, 13 miles south west of Alnwick.